Steam escaping sharply from a pressure cooker, was part of our morning memories. This steam carried with it the fragrance and the promise of our meals for the day. It goes to Cindy's Black and White Wednesdays # 73 originally created by Susan and hosted this week by Zorra. The unsung heroine's of our daily lives toiled within the cramped kitchen's, managing the patriarchal expectations of a 'complete Indian meal'. This 'complete Indian meal' had elastic boundaries, stretching to include festivals and fasts, snacks and guests, pampered children and fancies, grandchildren and treats, assorted neighbours and sweetmeats, friends and more family. It arranged the heroine's routine, from her first waking moments to when her work ended. But wait, perhaps it also inordinately occupied our heroine's sleep, dreams and thoughts. This fairly impossible task would have been herculean without the sturdy, Indian pressure cooker. Through this important role, the dependable contraption has moulded itself to our cuisine and social fabric. This has been obliquely acknowledged by our patriarchal Indian guardians. In a cliched advertisement which caters to our notions of the ideal Indian woman and her doting husband... Jo Biwi Se Kare Pyaar / The one who loves his wife... the pressure cooker figures prominently. This was followed by parodies in popular culture, of an exploding pressure cooker for spouses who did not like their wives or for brides, who did not bring the expected dowry. The pressure cooker figured prominently among the common incidents, given for a dowry death. Exploding cooking gas cylinders were the other common one. However despite this dark side, there is little dispute that the Pressure Cooker has taken Indian cuisine easily ( with most traditional elements intact) into our modern lives! Perhaps in a twisted way, don't we Indian women efficiently manage our kitchen, churning out made-from-scratch, nutritious food and all cooked in a healthy method to boot? This apart from managing our studies and careers when compared to our sisters in the west? Why have we not rec'd any kudos for this feat?!! :-D! So, it is frustrating and perhaps not particularly surprising ? to see another cliched, western attitude. This time, towards the pressure cooker. These breathless, concerned writings on how one used a pressure cooker and came out unscathed leaves us wondering whether it was the food or the author who went through the pressure cooker. What is worse is that none of these media outlets have taken the courtesy or the ground work to talk/ discuss/ research the use of pressure cookers with people who actually use them on a day-today basis. And yes, my favourite NPR falls into this too! 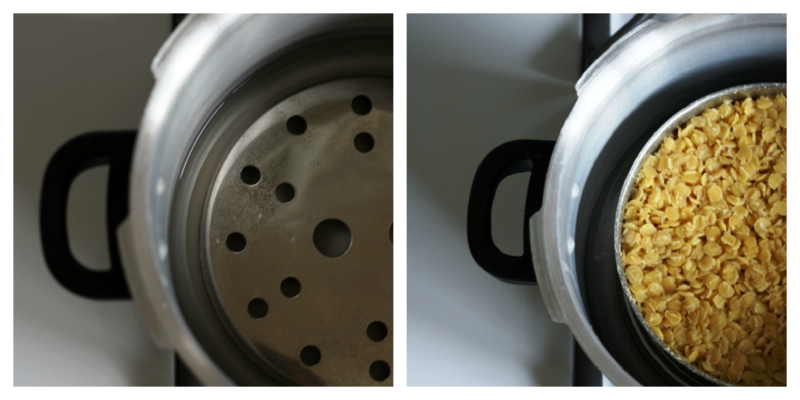 The pressure cooker has separate steaming vessels, held together with a sturdy wire-frame. The largest one at the bottom with at least two more on the top. On occasion, bemoaning the quality of these wire frames, we efficiently stack these containers without support, easily removing them with the traditional pakkad or Indian kitchen tongs! In a couple of sharp whistles, this would build the foundation of the meal ahead for lunch on time or be packed off into our tiffin boxes! A second routine would commence for the evening meal. Wait, what about the potatoes for that deep fried, tea-time snack? It would have been an uphill task for our mother's to make the traditional meals without the help of this one appliance. The whistle of the pressure cooker was drowned only by the roar of the mixie/ mixer grinder, grinding the rice and lentils for Idlis and Dosas, accompanying sammanthi's/ chutneys and the masala's both dry and wet. Puttu steamer tubes, crafted to fit, were snugly fixed onto to the lid's steam nob's for steaming. Elaborate Biryani's were layered in the deep well of this sturdy vessel. Non-vegetarian curries were whistled multiple times into submission and fall-off-the-bone tenderness! Apart from all that, the pressure cooker allowed an efficient use of the officially rationed, and many, black market, extra cooking-gas cylinders. Workhorse Wares: I have a 5 litre aluminium pressure cooker, another daily use, 3 litre aluminium pressure cooker both Prestige brand, a steel 3 litre Hawkins pressure cooker plus a Prestige aluminium pressure pan. I cook directly in the steel one and use the others in the water bath method. I have a stock of rubber gaskets, safety valves, pressure weights and a couple of extra handles. Importance of having these items handy, in the order given! The rubber valves are replaced regularly when they sag. Incidents: In the years since I started cooking in my own kitchen, I have replaced my first 3 litre aluminium pressure cooker along with a 2 litre aluminium pressure cooker after the bottom started caving out. More than a decade ago, our steel pressure cooker with copper bottom had to be thrown out, when the ManofFewWords left it on the stove-top and then forgot about it for some hours. The pressure weight was not on and the bottom plate slid out sideways. The safety valve of one, had to be replaced unexpectedly when daydreaming caused the pressure cooker to be left on the stove. It did not explode, it merely melted into the contents inside; both were thrown out and a new safety valve installed. 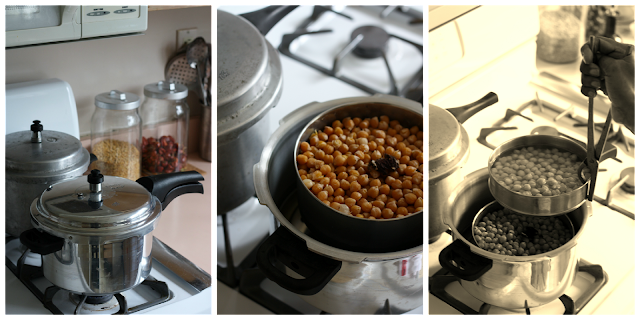 The cooked chickpeas went into a couple of recipes with some saved for Indian Chickpea Salad / Sundal. Chole Without Onions, Garlic and Tomatoes and another Chole recipe, photo here. Make sure that the water is half an inch above the trivet. Close the lid, making sure that it clicks into position and the handles are aligned. Turn the heat to medium high. ...Unsure about the chickpeas being cooked? Cooked chickpeas are ready for immediate use or for freezing. I cooked white chickpeas in my pressure cooker and it did not blow up in my face! Tell me that! Why are we looked down as inferior to our peers from the other part of the world? Even if our mothers/ grandmothers did not manage a career, did they not do credibly, what with managing on fewer resources, doing brilliantly with hobbies and more? I love your picture that goes for the B&W and the one last in the collage. to me the pressure cooker is as indispensable as my eating plate. Thank you Lata! Very well said. I cant imagine my kitchen without a pressure cooker, its one of my favourite utensil,and do cook everyday with it..Fantastic dish. Thanks Divya; will write in detail. Your dish makes me hungry! Can't do without this wonder gadget, nice post.. I loved the write up...very true, the pressure cooker plays an important part in one's (Indian Gal) life and in one's home ...it does have its shades of black, white and gray!!!! Loved the write up and the pics. I guess, I'm the only one around with no major incidents to report on pressure cookers :D And so true abt the 'complete Indian meal' having elastic boundaries.. Ha ha.. Thanks Priya! Am not able to post as much I would like to! Loved this post shri, Without pressure cooker I can even anything cooking in my kitchen. It makes life easy most of them. Clicks are beautiful. thanks for your blog which I quoted from in a piece I wrote today for Firstpost. Thanks for your blog which I quoted from in my article for Firstpost. All Rights Reserved. Any or all use without permission is prohibited. Simple theme. Powered by Blogger.